Malham Tarn is a small glacial lake set on top of Malham Moor, a well-known beauty spot in the Yorkshire Dales. Surrounded by rolling hills and bleak moorland, it is the highest glacial lake in England at 1250 feet above sea level. Malham Tarn is a haven for birds and wildlife and is surrounded by moorland and grazing sheep. The Drovers road known as Mastiles Lane is of particular historic interest, as it was used in Roman times. The tarn was given to the monks of nearby Fountains Abbey by William de Percy in the 12th century. After the Dissolution of the Monasteries it changed hands many times. its limestone lake, raised peat bog and fenlands. It is popular with anglers as the lake is home to some fine specimens of brown trout which flourish is the shallow pristine waters. With limestone crags and hidden waterfalls, the area is a pleasure to explore at any time of year. Its somewhat exposed position makes it quite bleak but there is a field study centre at the grand and beautifully situated Tarn House. It was built by Thomas Lister, Lord Ribblesdale, in 1780 as a hunting lodge on the site of an earlier house. The preserved cellars probably date back to 1570. The 10,400 acre estate was sold to the Morrison family in 1852 for the princely sum of £90,250. They added the East wing and remodeled the house in the style of Ruskin who was known to be a frequent visitor to this sporting residence. It remains relatively unchanged today. On the western shore, Tarn Moss can be seen, which is a wetland haven for wildlife and wading birds. There is a well-constructed bird hide overlooking the wetland reserve. Flycatchers, willow warblers. common coots, pochards, tufted ducks and mallards are all attracted to this small lake and its surrounding woodland, particularly in late summer and autumn. 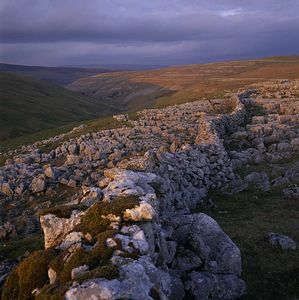 Birdspotters will also be interested in walking to Malham Cove. This raw limestone escarpment is a known nesting place for peregrine falcons. Volunteers from the RSPB and the national park rangers are available in high season to give information about the birds of prey which can be seen through the on-site telescopes. 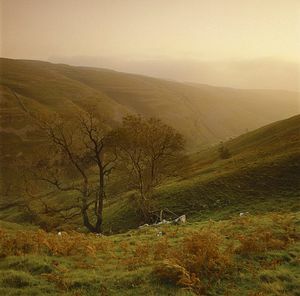 Sparrowhawks, kestrels, merlin, hen harriers and common buzzards all choose this area for breeding and raising their young along with a variety of other upland birds such as owls, redstarts and green woodpeckers. The Reverend Charles Kingsley was a visitor to Malham in Victorian times and he made it the setting for his classic novel, "The Water Babies". After exploring Malham Tarn, visitors can enjoy one of the popular walking routes to the lovely waterfall at Janet's Foss, Gordale Scar or Malham Cove. Hill walkers and those wanting to escape the busier footpaths may take the challenging walk across Fountains Fell which climbs to 2200 feet. The National Trust provides information and leaflets at its Visitor Centre at Tower Head Barn and there is also an interesting display about the challenges of farming in Malhamdale. The Pennine Way passes through this estate for 6 miles from north to south taking in some of the finest and most remote Yorkshire Dales' scenery. Malham Tarn and village lie on the Yorkshire Dales Cycleway, a signed on-road cycle route which passes from Airton (2½ miles away) in the south to Stainforth and Settle (7½ and 6½ miles away) in the east. At both places it links with the Pennine Cycleway, NCN route 68, which goes from Derby to Berwick upon Tweed. Several bikes can be carried on the Malham Tarn Shuttle Bus. From Skipton, service 210/843 and from Settle, service 580/210, alight Malham village, about 2 miles from Malham Tarn. Weekend services pass Skipton station. The National Trust run a shuttle bus to Malham Tarn and Malham village every weekend and bank holiday from Easter to October. It travels between Ilkley, Addingham, Skipton bus station and , Settle and Malham Tarn. Sponsored by Skipton Building Society, it has a satellite-triggered audio tour on board and can carry several bikes. Settle station 7 miles and Skipton station 19 miles on the very picturesque Settle-Carlisle line. From Skipton, take the A65 to Gargrave, then follow signs to Malham. From Settle, follow signs to Langcliffe or Malham. A minor road crosses the Malham Tarn estate to the north of Malham Tarn. Join it from the B6160 below Kettlewell.